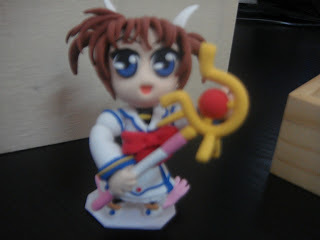 Enjoy the world of clay creations & others artworks,including anime,and none-anime stuffs. Everyone can request for any anime or non-anime characters you like. After searching some information about starting a blog, I think I know how to use it now, although I still doesn't know how to add templates (Don't know whether can or not). This is from 2011 June. This was from 2012 March. Yes,this character was Takamachi Nanoha from Magical Girl Lyrical Nanoha, doesn't she loks cute? Compared to 2011 creation, did it got difference? Some of my friends said it does a lot. 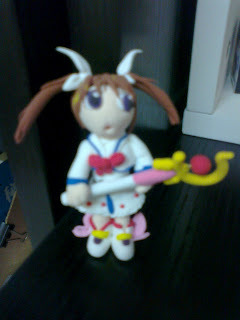 Actually I had give the one made on 2011 to my friend because she loved Nanoha a lot, now I feels sorry to my friend >< . I always having a big interest on Japan anime and manga,I think most of you does right? I always don't had much money to buy the anime figures,but now this wasn't a matter to me anymore!